For further assistance give us a call. Follow the A58 (Bolton Road) from Bury for about half a mile. At the lights turn left at the cross roads (on the right is the Ainsworth Arms Pub). 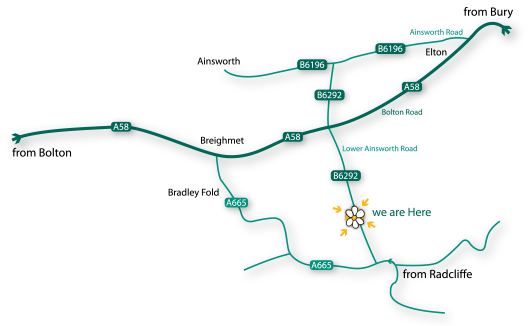 Then Follow the B6292 (Higher Ainsworth Road), go over the bridge for a further 100 meter and we are on your right.